~Many aspects of life culminate in a conclusion of one chapter and the beginning of another. For example, when a person gets married they begin to build a new life around their loved one and children may come along later. In an academic sense when a young person graduates from college they enter a new phase, almost a coming of age period in which they study a course at University for a period of 3 -4 years, develop their social circle, learn essential life skills and for the majority of young people they begin to free from the shackles of their parents. This sense of freedom can be expressed in many ways. For the nervous ones they may create a piece of art. For the more outgoing ones however, dance movement can be an innovative and great expression of how you are feeling to the outside world. 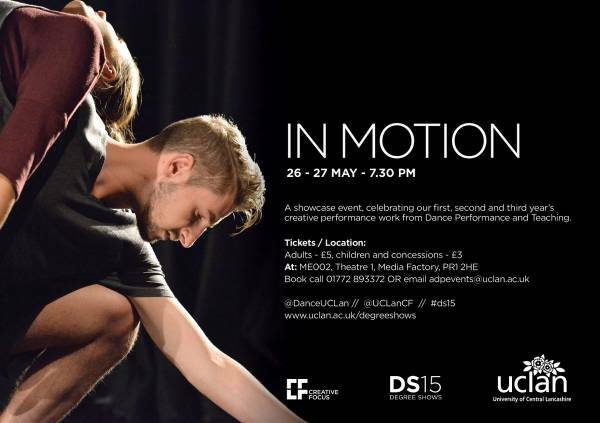 Over a two day period UCLAN is celebrating the marvellous work studied and carefully practiced by all three years of the BA ( Hons) in Dance, Performance and Teaching degrees. It will take place from May 26th -27th from 7.30pm -9pm at Room 002 of the Media Factory. Tickets are £5 for adults and £3 for OAPs, Under 16’s, students and concessions. You can book them by visiting :- www.uclan.ac.uk/news/events. Please be aware that these performances may contain flashing lights. ‘In Motion’ is an opportunity to appreciate the arduous hours and self - sacrificing spirit these devoted students have undertaken over the last several years. Show your support by attending and congratulating their efforts.